As we’ve discussed (see Get Started with FeedBurner), FeedBurner creates a browser-friendly way for readers to subscribe to your blog (either in a feedreader or by email), tracks your subscribers numbers, and offers a number of other useful tools for optimizing, publicizing, troubleshooting and monetizing an RSS feed, including integration with Google Analytics. There is really no other service that offers all this functionality... no matter how frustrating FeedBurner's occasion hiccups and glitches may be! Want to tweet your posts with more than one Twitter account? Simply “burn” another feed at FeedBurner (use same RSS feed URL from your blog, just give it a different name) and point it at a different Twitter account. But do be careful about typos when adding your Twitter account — right now, there is no way to remove a Twitter account if you make a mistake, so the only recourse would be to disable Socialize for that particular feed. The FeedBurner Socialize service makes it easy to distribute your content to interested subscribers or followers on social networks using any FeedBurner feed you already have. 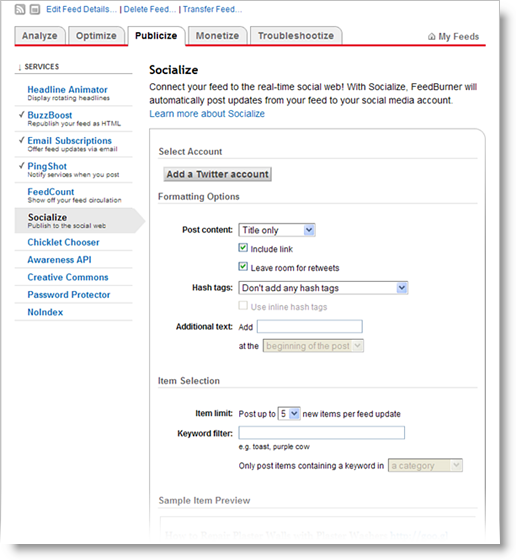 The Socialize service currently supports distribution on Twitter. Did you notice the wording of that last sentence? This seems to imply that Google might be planning to add other social networks in future, perhaps to become the one-stop distribution (and tracking) service for RSS feed-enabled blog content. It should be interesting to watch how this develops! As part of the Socialize feature, Google has also introduced a new URL-shortening service (goo.gl), but this is not yet a replacement for bit.ly, tr.im, ow.ly, su.pr and the like — it’s only available from the updated Google Toolbar and through FeedBurner, at the moment. Mind you, Google does say that if it proves useful, the service could be expanded. If you already make a practice of tweeting links to new posts on your nonprofit’s blog, you may have automated that task with one of the existing feed-to-Twitter services, such as the aptly named Twitterfeed — or perhaps you prefer to stay away from automation and tweet with the personal touch? Either way, what Google FeedBurner has on offer here is the convenience of managing your RSS-to-Twitter feed and your blog subscribers in the same place, with the potential to tie in to Google Analytics. What do you think? Will your organization use FeederBurner’s new Socialize feature? Thanks Jen for making me aware of this. Was just in on my Feedburner account, and did not catch this nice addition. It will be interesting to follow Google short url service. I think it came out after the news about Facebooks short url option. Tried out Facebooks short url yesterday. But seemed to be attached to a Facebook permalink that I had not permission to view. So guess they are testing it out on limited accounts at the moment. But it will bring Facebook fan pages to a new level, with a short url option from Facebook. I'll give you a tweet for this article. As you know, bit.ly has great stats on clicks. Do you know if the Socialize feature gives you the ability to enter your bit.ly key? Are, yes, Google's been a busy little company recently, hasn't it? John, I'd missed that - thank you! Having the ability to use bit.ly with FeedBurner (if that's your URL-shortener of choice, as it is mine at the moment) instead of goo.gl makes Socialize much more attractive!